Forever 21 can be a mixed bag when it comes to clothing quality, but when you find one of their hidden gems, it can be pure magic. They're a rare find, but a handful of Forever 21 items have a TON of good reviews. The following items all have at least 10 reviews and an overall rating of at least 4.0/5. 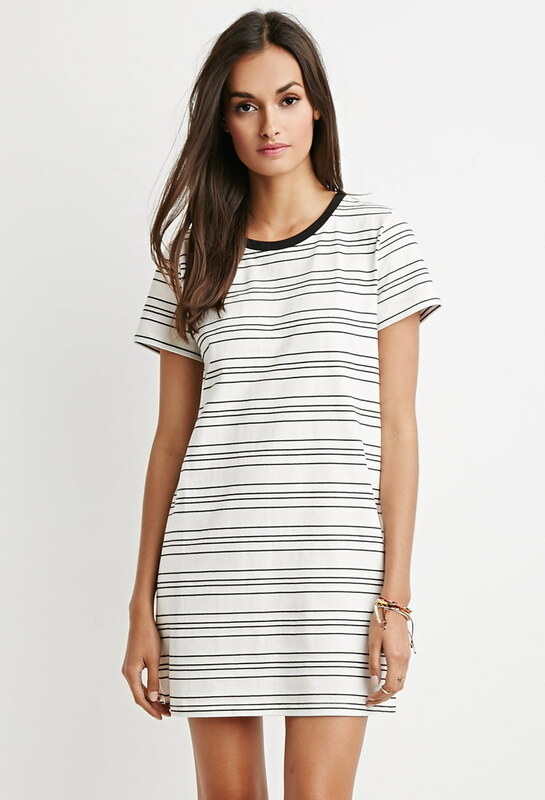 Pro tip: A lot of these items are F21 ~classics~ that are frequently restocked, so if they're sold out of your size, sign up to get an email when it's back in stock. Most convincing review: "As a minimalist (90%) in fashion, I LOVED the looks of this darling dress when I first saw it online. It does not disappoint." Available in sizes XS–L. Also comes in cream. Most convincing review: "These pants are just the bomb. They're so comfy and loose and breathable and lightweight. Perfect for the summer weather. Very trendy as well." Most convincing review: "I bought this dress on a whim in anticipation of warmer weather and I could not be more pleased!!! The fit is great and the flare of the skirt is very flattering for this thick-waisted gal. My hubby said, 'It's a keeper!'" Most convincing review: "I was a little scared about ordering these shoes because I thought they wouldn't fit correctly. I'm so glad I bought them because the zipper and the laced-up part allows you to adjust the shoe to fit your leg. These shoes are so cute and comfortable!" Available in sizes 5.5–10. Also available in tan. Most convincing review: "This is hands down the sexiest bralette I own. Just do yourself a favor and buy it before they're long gone." Most convincing review: "This pair of jeans was great. Very flattering, stretchy and comfortable. It runs a little big, so i would recommend you to buy a size smaller than the one you usually buy. But overall they're awesome." Most convincing review: "I will be wearing this dress for an upcoming concert. I was so eager to see how it would look on me from the day that I ordered till the day that I found it in my mailbox that same week. I put it on and immediately fell in love with it. I said 'Yeah baby, this dress is it!'" Available in sizes XL–3X. Also comes in royal blue. Most convincing review: "These are so on-trend at such a low price—it's a must-have! One of my favorite purchases from Forever 21. They look just like a pair I saw at Topshop, but at a much lower price. Wear them with cool sneakers or heels and minimal accessories." Most convincing review: "The bag expands to accommodate a plethora of items, including a sweater, book to read, personal papers or just the basics ... Love the bag and best of all no animals were harmed in its production." Most convincing review: "This is going to be my go-to crop top. It's comfy and cute. I bought this in black and white and I love them both." Available in sizes S–XL. Also comes in black and cream. Most convincing review: "Love this skirt. Wore it to a date and felt confident in it. It has a classic feel to it with the lace giving it a feminine look that is gorgeous. Bought it in two colors and I'm glad that I did." Most convincing review: "I love this suit! It's soooo stylish and fits perfectly. If you're hesitant about the cutouts drawing the wrong attention to your midsection, don't be! It's one of the MOST flattering things I have ever worn, hands down." Available in sizes 0X–3X. Also comes in royal blue and black. Most convincing review: "Beautiful, lively yet modest dress. Perfect for work. I have not worn it yet but the quality is good." Most convincing review: "Must buy this!! Fits so well and it's so pretty! Having this sports bra makes me excited about exercise!" Available in sizes XS–L. Also comes in black. Most convincing review: "Fits wonderfully and makes my shape look great. I'm in love with this dress!" Most convincing review: "I freaking love these shoes so much — they can go with anything and they are so comfy." Available in sizes 6–10. Also comes in black, red, and pink. Most convincing review: "This dress is durable. Hugs your curves, and stylish. I will pair with Converse. You can pair with heels for a night out or sandals on a beautiful spring day." Available in sizes S–L. Comes in six colors. Most convincing review: "This is by far the best item I've purchased from Forever 21. Versatile, cute, the sleeves are too long, but could be rolled up. I love it." Available in sizes S–L. Also comes in a medium wash. Most convincing review: "LOVE, LOVE, LOVE this shirt! It's really 'in' right now and it goes with everything! Super good price, too!" Available in sizes S–L. Also comes in blue, black, and white. Most convincing review: "I am in love with these! They look and feel like some expensive Nike or Lululemon workout pants, but for a fraction of the price." Most convincing review: "I bought the 'medium denim' pair last summer and I LOVE them! They fit me perfectly and they're super comfortable. This pair reminds me a lot of a pair I saw in American Apparel, but these are so much more affordable!" Available in sizes 24–31. Also comes in three other washes. Most convincing review: "I've been hunting everywhere for a crossbody bag that does the following: Fits my passport, my continental-sized Prada wallet, and a full-sized water bottle inside. Enter this crossbody bag from Forever21 ... The faux leather looks real and the zipper on top is great for when you're traveling." Most convincing review: "Wore this to a rock festival, but am also planning on wearing it everywhere from work to the beach. So versatile. Was wary that it would be see-through, but it's double-lined so it's not at all. Highly recommended." Most convincing review: "Saw a skirt similar to this one on a TV show and fell in love; when I found this one on the Forever 21 website, I had to try it. Once I got it, it exceeded my expectations." Most convincing review: "This is one of my favorite items purchased from the F21 Plus line! The fabric is light but not too clingy and the back cut is extremely flattering and DOESN'T SHOW YOUR BRA! I ordered it in navy and have re-ordered it in the black and white as well!" Available in sizes 1X–3X. Also comes in black, navy, and burgundy. Most convincing review: "Wear it with a nice hat, some chic sunglasses, a cool printed overcoat, and you're in business." Available in sizes S–L. Also comes in white. Most convincing review: "I was kind of nervous to get this dress, which is how I normally feel when I purchase things from Forever 21 Plus. Being plus size, I wear a 3X in most Forever 21 Plus clothes, but sometimes even a 3X is too small. So it's really a touch-and-go thing. This dress fits perfectly. Not tight at all (which I was worried about). It's such a lightweight fabric, and it wasn't wrinkled at all when I took it out of the bag. The design of it really compliments my small waist, but wider hips. I foresee many occasions wearing this dress!" Available in sizes 0X–3X. Also comes in black. Most convincing review: "Oh my goodness—this skirt is adorable. Great to wear for work. Looks cute with a button-down chambray top. I love the elastic waist because you don't have to worry as much about 1) sizing and 2) struggling in the bathroom." Most convincing review: "I never wear jeans so having something that looks like denim is kind of weird for me but I love this dress. It's really cute and casual. I feel very artsy (like a painter) in it." Most convincing review: "I'm perfectly satisfied with this garment. It's exactly what I expected: a simple, versatile jersey dress that's easy-to-wear and can be dressed up or down." Most convincing review: "I am a big fan of F21 bags, but this one takes the cake. It's the perfect size to commute and carry my essential: the two big compartments make the access so easy and it feels sturdy and durable. Lord, I'm so in love with this bag." Most convincing review: "Love the way this dress feels. I bought it in a size up from my normal size, and it's comfortable and flattering. Seriously so in love! And it's floral so you really can't go wrong." Most convincing review: "Fits perfectly! I loved the dress online and loved it even more when I bought it. I was a little worried about the sleeves fitting my arms, but when it's on the sleeves fit just as well as the rest of the dress. The belt doesn't fit like it should but I don't really care since I wasn't planning on wearing it anyway." Most convincing review: "This is so adorable! I feel like a princess when I wear it!" Available in sizes 32A–36D. Also comes in black. Most convincing review: "This skirt is so comfy, versatile, and CUTE! It fit perfectly and I was ecstatic to find out it had POCKETS! Aaahhh, a comfortable skirt that you can wear with pretty much anything that has POCKETS! I love it. I also thought that the length was just right. Definitely recommend!" Available in sizes XL–3X. Also comes in a light wash. Most convincing review: "It's a very cute and simple summery dress. It's perfect for a vacation at the beach." Available in sizes XS–XL. Also available in blue. Most convincing review: "These are beyond anything I could have imagined, so stylish without being in-your-face trendy, and VERY comfortable!" Available in sizes 5.5–10. Also comes in taupe. Most convincing review: "Bought the white in the store and fell in love. I've tried many t-shirt dresses, and this one is the winner. I'm 5'7", 130lbs, and the small fit perfectly! It's very flattering, and the back detail is nice surprise."